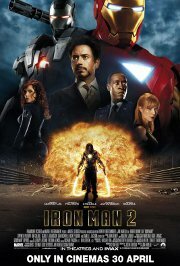 In Iron Man 2, the world is now aware that billionaire inventor Tony Stark is the armoured super hero, Iron Man. Under pressure from the government, the press and the public to share his technology with the military, he is unwilling to divulge the secrets behind the Iron Man armour because he fears the information will slip into the wrong hands. With his assistants at his side, he forges new alliances and confronts powerful new forces. Commander Stark reporting for duty, Sir! Comments Comic book, robot-style violence, moderately intense, muted by some comic and unreal effects.